If you're the kind of lazy person who sits around watching the grass grow in the yard (or the dust settle on your furniture, depending on the season), then that's a good kind of laziness. You're not burning any fossil fuels, you're not hurting anyone. I commend and encourage that type of laziness. More people should stay put and do nothing more often. Or maybe do a jigsaw puzzle. Personally, I'd much rather play with my hair and think about life than work any day! But there's another type of laziness that is dooming the future, and that's the laziness of climate change deniers, skeptics, ignorers and delayers. These people are too lazy to learn, too lazy to research, too lazy to find out for themselves, too lazy to ever change their tune (by gawd, they are boring! ), and too lazy to give a damn about their children's future. They just keep pushing the same (usually partisan) stuff. They lack imagination. They never seem to learn anything new. They'll glom onto "same old same old" stuff that suits their purpose (which usually has to do with maintaining a status quo that maintains their wealth and/or comfort and/or worldview), but they don't offer anything thoughtful or compassionate or wise. I read their schlock from time to time, then tear myself away from doing nothing to research their claims (haven't found one to be correct yet). Why can't they do the same? 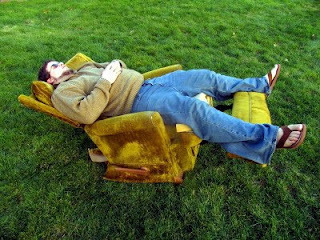 Just when you wish they were rocking away in their La-Z-Boy™ recliners, with their children or grandchildren on their knees, they rev themselves up for a little hacking and cherry picking, obfuscating and misleading. Why do they have the energy for that, but no energy for safeguarding their children's future? It's enough to send me back to watching the dust gather.